Jacques L. Condor (also known as Maka Tai Meh) has written one of the spookiest tales in this collection, and one of the hardest to put down. “Those Beneath the Bog” is a story of culture and spirituality running up against deadly secrets of the past. Prunie and her husband Martin are hunting for moose along with her aunts, an uncle, and several other members of her aunts’ home town. The hunt is difficult, and leads them at last to the shores of Rabbit Lake, where there are rumored to be not only moose aplenty, but also dark, evil spirits lurking in the sink hole at the center of the lake’s northern bog. But when Aunt Rosie prophecies the death of two of their hunting party, will the others listen? And if they don’t, will two be the only ones who die? This story is super chilling. On my tight time-schedule with the Little Guy, I saw the page count on this one and thought there was no way I’d be able to gather enough minutes to read the whole thing, but I’m telling you: two pages in, and you won’t be able to stop even if you wanted to. Mr. Condor’s descriptions of Rabbit Lake and the truly terrifying creatures lurking there will have you shivering even in the summer heat. Spooky and delightful, this is one not to miss! 1. The Writing Question: Do you have an element of writing (plotting, characters, world-building, dialogue, etc.) that comes more easily to you than others? Any you find particularly difficult? For me, it’s the the dialogue. I have been a people watcher for 70 plus years. I love to listen to the way people talk, their accents, their use of colloquial words and phrases, and my mind stores them all away. Also, I was a professional actor for fifty-odd years before I came to writing, and for an actor, dialogue is the first clue to your character. The most difficult thing for me is plotting. It is almost always drudgery for me. 2. The Zombie Question: What is your favorite work of zombie fiction (literary, film, comic, etc.)? At age 86, I am probably the grandfather of all the other authors in this collection. I came into the world of zombies in the 1940’s during the Second World War, when America sent troops to the Caribbean and Central America, and they brought back stories of zombies. My two favorites are antique films: Bob Hope, Paulette Goddard, and Gail Sondergard in “The Cat and the Canary” and the utterly terrifying performance of Boris Karloff in “I Walked With a Zombie”. Incidentally, there was never any talk of “brains” and eating human flesh in the early zombie world of film and literature. 3. The Random Question: Where is one place you think everyone should have the chance to visit in their lifetime? That’s easy. Alaska and the Yukon and the northern portions of British Columbia. IT is such a different world, and the many cultures of the aboriginals are a source of inspiration to any visitor. Jacques L. Condor (Maka Tai Meh, his given First Nations tribal name) is a French-Canadian Native American of the Abenaki-Mesquaki tribes. He has lived in major cities, small towns, and bush villages in Alaska and the Pacific Northwest for fifty-plus years. He taught at schools, colleges, museums, and on reserves about the culture, history, and arts of his tribes for twenty years as part of the federal government’s Indian education programs. Now 85, Condor writes short stories and novellas based on the legends and tales of both Natives and the “oldtime” sourdoughs and pioneers. He has published five books on Alaska. Recently, his work appeared in five anthologies: Icefloes, Northwest Passages, A Cascadian Odyssey, Queer Dimensions, Queer Gothic Tales, and Dead North. If you’re tired of all the modern-day twists on zombies and want something eerie from a deeper past, look no further than “What Still Abides” by Marie Brennan. Set in pre-Christian England among druids and runes, Brennan weaves a chilling tale of death gone wrong. When a corpse refuses to stay down in his grave, the strongest magics and warriors come to the ruling eorl’s aid. But can anything be stronger than Death itself? This story is chock full of mood and atmosphere; I dare anyone to turn the page on this one without feeling the chill of the moorish winds. 1. The Writing Question: What is your typical writing routine? Do you write every day, some days, only when inspired? I’m a night owl, and always have been. It’s like my brain turns on at ten p.m. Since I’m lucky enough to write full-time (thanks to the support of a gainfully employed husband), this means I work at night, usually going to bed somewhere between one and three a.m. When I’m working on a novel, I write nearly every day, with a minimum wordcount I have to hit before I let myself stop for the night. In between novel drafts, though, it’s much more hit-or-miss. 2. The Zombie Question: What enticed you to writing this zombie story? “What Still Abides” is inspired by the English folksong “John Barleycorn,” which is one giant metaphor about the making of beer. The last line is “and we shall drink his blood!” — i.e. the beer — but that made me look back at all the lyrics about the awful, violent things they did to try and kill John Barleycorn, and ask myself what would happen if I took them literally . . . .
I’m currently writing Chains and Memory, the sequel to an urban fantasy called Lies and Prophecy that I published in 2012. That will be out in early 2015, around the same time as Voyage of the Basilisk, the third of the Memoirs of Lady Trent. Marie Brennan is the author of nine novels, including the series Memoirs of Lady Trent: A Natural History of Dragons, The Tropic of Serpents, and the upcoming Voyage of the Basilisk, as well as more than forty short stories. A Natural History of Dragons is a finalist for the 2014 World Fantasy Award. More information can be found at swantower.com. “Pollution,” by Don Webb, is a tale of exclusion and loneliness, lived out in the heart of a near-future Japan. All Billy has ever wanted since he was a teenager was to be Japanese. He knows the language, studies the culture incessantly, and now lives in Nagoya as an English teacher. He does everything he can to fit in, to become what he was not born, but all his work seems in vain. But when he encounters an American kyonshi, a mechanically rehabilitated corpse used in the service industry, he gets a chance to glimpse into the hierarchy society in a way he never considered before. Thoughtful and restrained, “Pollution” will linger in your quiet thoughts long after you’ve set the book aside. 1. The Writing Question: What is the best or worst piece of writing advice you’ve received? All writing (even far-out writing) is autobiographical in some sense. All autobiography is far out fantasy in some sense. I learned this from Zulfikar Ghose. 2. The Zombie Question: What part of the zombie trope do you find yourself most drawn to or most irritated by? The mindlessness of the zombie gives me little room for dialectic. The living may discover some of their own darkness, what does the zombie learn? Hippocampus Press is releasing (August 2014) a thirty year retrospective of my Lovecraftian fiction Through Dark Angles. Don Webb has been published in every major SF/F/H magazine in the English- speaking world from Analog to Weird Tales. He teaches “Writing the Science Fiction Novel” at UCLA extension. He lives with has a beautiful wife and two tuxedo cats in Austin, Texas, where he has been a guest at the four local SF conventions for over twenty years. Jay Wilburn’s story in Zombies: More Recent Dead will give you chills. “Dead Song” documents the rise of indie music among the survivors in a post-apocalyptic zombie landscape. There are some great, humorous touches to this story, and Mr. Wilburn’s got a great eye for sidelong commentary, but I guarantee this story will get to you. I couldn’t put it down. The darkness in this one creeps up on you slowly, inching up like a slow tide until it’s all around you and there’s no shore in sight. Beautiful, sometimes funny, and spine-tingling, you’re going to love this one. 1. The Writing Question: Do you write for a living or do you have a day job? What about your current financial situation do you like or dislike? I write full-time. I used to be a public school teacher for nearly sixteen years. The younger of my two sons became ill and we had to make some changes. I quit my job mid year and stayed home with him. My master plan was to write zombie stories to pay the bills. With horror, science fiction, and other genre, I managed to pull it off. I do ghostwriting and freelancing as well and between my own fiction and work-for-hire, I have managed to pay my rent as I stay home with my kids. The writing and the family are all doing well for now. I tell people that quitting your job to write full-time IS a crazy, stupid idea, but that doesn’t mean you can’t do it. Sometimes it is easier to write when you don’t have the pressure of paying bills with it. Sometimes the threat of starvation is a hell of a motivator. I don’t believe we are nearly as trapped in life as many of us believe ourselves to be. The worst that could happen in following your dreams is that you fail miserably, but that can happen even when you are following no dream at all. 2. The Zombie Question: What do you think is behind the mass appeal interest in zombies for the last 10 years? The funny thing about this question is that people have been asking it for twenty or thirty years now. People have been predicting the demise of the zombie for just as long too. I think part of it comes down to the fact that fans of the trope are hungry for it. There is tons of bad fiction in all media with some pronounced examples in zombie-related fiction, but that somehow adds to the hunger for something good. The trend seems to be to change up the zombie as the answer, but The Walking Dead is probably the broadest example of the rise in mass appeal in the last ten years and they follow as close to the “Romero traditional” universe of zombies as anything out there. After about season two, I had far more regular people coming up to discuss their zombie plans with me. Story and all its elements rule all. I think the greatest drive in the appeal of the zombie is this unspoken belief in many that the remaining potential is far greater than what has been realized in the kinetic. Whether that is true or not, the majority of fans are waiting to see what comes next as they feed on everything they can get. 3. The Random Question: What is you favorite hobby other than writing? I enjoy archery. In just about everything I do, writing is on my mind. Travel, being with friends, reading, running errands, etc. Everything I do is processed and analyzed in my mind before, during, and after from the standpoint of pieces for future stories. Archery is one of those activities that allows me to turn off the machine. I might still be thinking about killing zombies as I’m doing it, but aiming and hitting the target shuts off the processor for a little while. Jay Wilburn lives with his wife and two sons in the swamps of coastal South Carolina. He left teaching after sixteen years to care for the health needs of his younger son and to pursue writing full-time. He has published Loose Ends: A Zombie Novel with Hazardous Press and Time Eaters with Perpetual Motion Machine Publishing. Follow his many dark thoughts at JayWilburn.com and @AmongeZombies on Twitter. Marge Simon’s poem in Zombies: More Recent Dead may only be a page long, but I can guarantee you won’t forget it. What happens when those who are supposed to love and protect you become the monsters you fear? Read “The Children’s Hour” once, twice, a hundred times–the horror lingers with each encounter. With both writing and poetry, most of the time I do very little, if any, planning. It’s more fun that way (fun-work) and it suits my personality. But I do write (especially work on poems) every day. New: any of Joe McKinney’s novels, especially his first series, FLESH EATERS, APOCALYPSE OF THE DEAD, etc. 3. The Random Question: What are you reading currently? SAVAGE NIGHT by Jim Thompson. No, it’s not about zombies, but it is extremely dark. Marge Simon’s works appear in publications such as Strange Horizons, Niteblade, DailySF Magazine, Pedestal, and Dreams & Nightmares. She edits a column for the HWA newsletter, “Blood & Spades: Poets of the Dark Side,” and serves as Chair of the Board of Trustees. She won the Strange Horizons Readers Choice Award 2010, and the SFPA’s Dwarf Stars Award 2012. In addition to her poetry, she has published two prose collections: Christina’s World (Sam’s Dot, 2008) and Like Birds in the Rain (Sam’s Dot, 2007). She won the Bram Stoker Award for Superior Work in Poetry for Vectors: A Week in the Death of a Planet (Dark Regions Press, 2008) and again in 2013 for Vampires, Zombies & Wanton Souls (Elektrik Milk Bath Press). 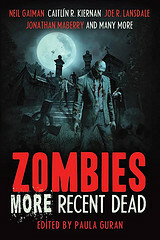 As September draws ever nearer, we’re getting into zombie hunting season and the preparations for the release of Zombies: More Recent Dead, edited by Paula Guran and published through Prime Books! This is going to be a great anthology, if I do say so myself. There are some truly amazing talents included in the pages of this book. In the meantime, here’s the current ToC (in alphabetical order) to whet your appetite for zombies!